GSG Expo Updates: 'Industrial Artificial Intelligence' for the mattress industry - Google it! 'Industrial Artificial Intelligence' for the mattress industry - Google it! It's easy to get sucked into the news stories about robots and the imminent "robotcalypse" that will replace all our factory workers. That storyline has been prevalent since the mid-20th century, and it's an easy-to-grasp concept for most people. It's been in the making for 75 years, but it still hasn't really materialized. Here's a new storyline that's not quite so easy to comprehend for some: industrial artificial intelligence . It's not about placing a micro-chip in your brain like some science fiction writers like to imagine, but it does place a micro-chip in your factory machines to learn processes and become more efficient. This is similar to cloud-based retail IoT systems offered for residential HVAC systems, home security, and turning the lights off when you leave your house - but specific to machine efficiencies. Google already offers some Cloud-based AI packages, but this is a little different. This new chip program can be installed directly at the machine level for more greater cyber-security control, and better satisfy industrial needs locally. Google doesn't do everything right, but they do know a few things about algorithms and user-friendly systems, and those details are key to AI success in the mattress factory. It may still require some high-tech mojo on your part to install these Google chips, and produce a useful program to interpret the collected data. In order to effectively take advantage of AI down the road, you're first going to need to identify your manufacturing efficiencies and waste areas ahead of time. Greenlight XT OEE system in use on a Porter mattress border machine. The easiest way to start is with a "bolt-on" Overall Equipment Effectiveness application like our Greenlight XT system from GSG. You can automatically track machine operations, identify downtime and service issues, piece counts, and other critical production operations in real-time. Greenlight assimilates this info for you in customize-able charts and reports, and you can put it to use immediately! 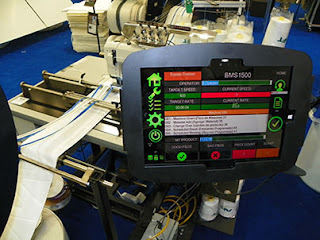 This highly-affordable Greenlight system does not require any chip integration or special programming, and it can be retro-fitted to most existing factory machines. You can choose to follow the interpreted metrics on your in-house server or access it remotely via the internet. If you're a naturally intelligent business person, you'll take your first step towards Industrial Artificial Intelligence with a visit to the Greenlight webpage at the GSG website.